Developer: Cambridge English Online Ltd.
Cambridge English Online has recently added some new apps to their repertoire. This one is called Play, Sing & Share Education. 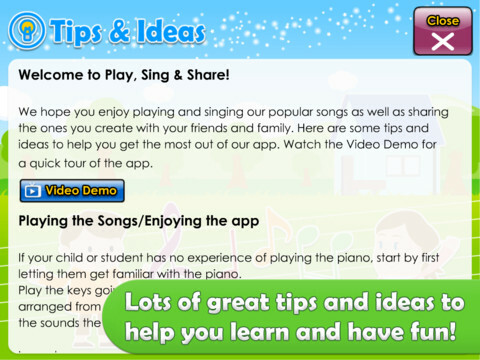 The first thing my preschooler and I did was play the video demo under Tips & Ideas to get a good feel for the app. The video demo was a great walk-through the entire app. It explained what the various buttons meant and how to do everything. There are many learning opportunities currently within three nursery rhymes: Incy Wincy Spider, Baa Baa Black Sheep, and Twinkle Twinkle Little Star. Children can learn to play the piano, read/sing along to the melody of the nursery rhyme, as well as practice listening skills. There are also 3 different type of keyboards to choose from as well as pertinent sound effects that follow the particular nursery rhyme. For example, Incy Wincy Spider includes the sound of sun, rain, and several different instruments. The melody option plays the background music for you to play the piano and/or just sing along to. The song option has the singer singing along. Or you can just play the piano without a background by following the notes. My preschooler is very familiar with the 3 nursery rhymes and the tunes, but she has absolutely no training of reading the music. So she wound up having the melody on in the background and just pressing random keys on the piano, still to the beat of the rhyme. And I consider this to be an awesome opportunity for the child to share his/her creative side. (A child can just perform whatever they please, record it, play it back, as well as email it to friends and family. This fun app is well done. Welcome to the fun App that will have your children playing piano, singing classic kids songs, and sharing them with friends and family! 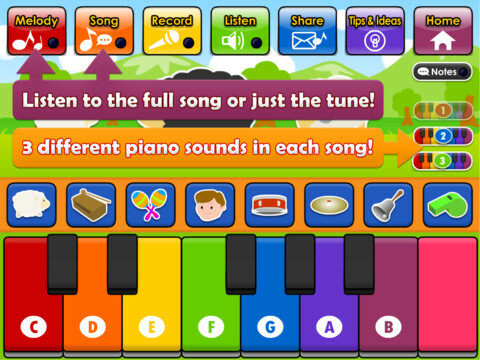 The Play, Sing & Share App iPad is a unique app that combines the skills of piano playing, basic early reading, and listening skills into an app that will provide hours of enjoyment. 13 notes from C to C, just like a real piano! Plus you can choose from three keyboard sounds for each song! 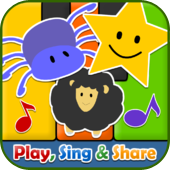 Children can learn to play Twinkle, Twinkle Little Star, Baa, Baa, Black Sheep and Incy Wincy spider by following along to the notes on the page. Next, they can listen to the song, or the melody of the song and play along. Each page has a recording function, so the young learner can record their progress, and even email the recording to friends or family. 8 fun sound effect buttons per song add to the creative experience of each song. 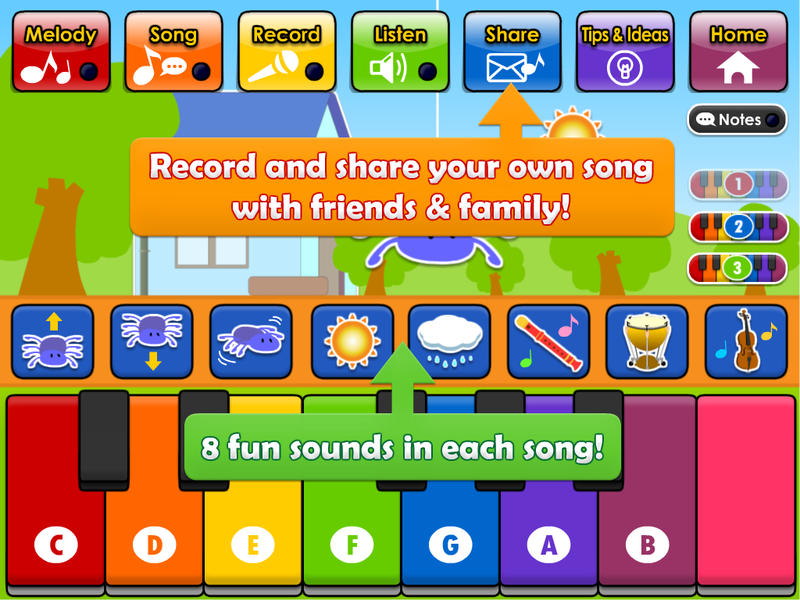 Play the song, use the sound buttons, sing and record! Now listen, it is a blast! All of the songs are in the key of C, and this app helps build skills that are transferable to a real piano, or another keyboard. It is a great, and simple entry into the world of playing and singing for youngsters! – Keyboard with 7 different sound selections! Choose from piano, marimba, organ, and more! – Record and Share functions to share your little masterpieces with the world! Check out our other app by visiting our developer page. Just search for ‘Cambridge English Online’ on your local App Store.